When this option is disabled (default setting) and a tracking lifetime length is set, Deadline Funnel will create a new tracking record whenever an incoming webhook is received. When this option is disabled and tracking lifetime is set to 0, Deadline Funnel will create a new tracking record when a webhook is received for an email address that is not currently being tracked. 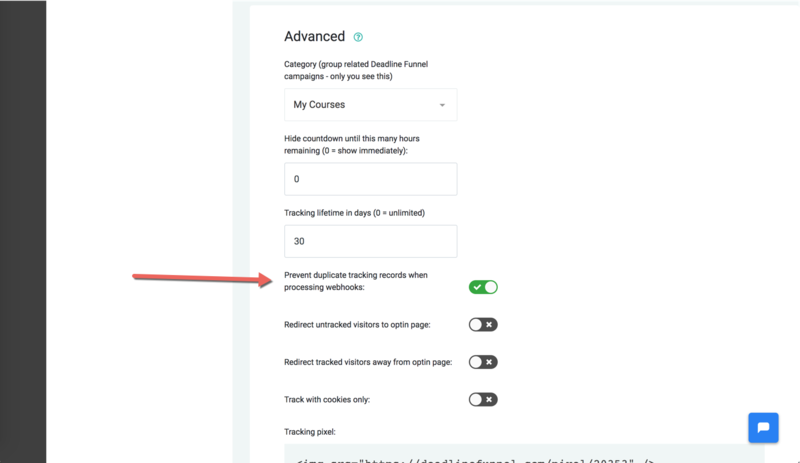 When this option is enabled and tracking lifetime is set to 0, Deadline Funnel will not create a new tracking record when a webhook is received for an email address that is currently being tracked. When this option is enabled and tracking lifetime is set to a number of days (i.e., 10 days), Deadline Funnel will create a new tracking record when an incoming webhook is received for an email that is not currently being tracked. When this option is enabled, and tracking lifetime is set to a number of days (i.e., 10 days), Deadline Funnel will not create a new tracking record when an incoming webhook is received for an email that is currently being tracked when the tracking was created less than 10 days ago. When this option is enabled, and tracking lifetime is set to a number of days (i.e., 10 days), Deadline Funnel will create a new tracking record when an incoming webhook is received for an email that is currently being tracked if the tracking was created more than 10 days ago.